The marine environment is currently well explored as one of the most essential sources regarding to natural products in research, since organisms from oceans have exhibited exceptional biological, biochemical, and biosynthetic potential. Similarly, microorganisms’ natural products represent a substantial area for novel therapeutic compounds search. Many reviews highlighted microbial metabolites as targets for discovery and development of new drugs, especially anticancer, antibiotics, antifungals, and antiparasitics among others. Marine fungal endophytes are therefore virtually unlimited sources of novel compounds with numerous potential therapeutic applications due to their immense diversity and proven ability to produce natural products of medicinal and pharmaceutical importance, thus inspiring researchers to further study them. 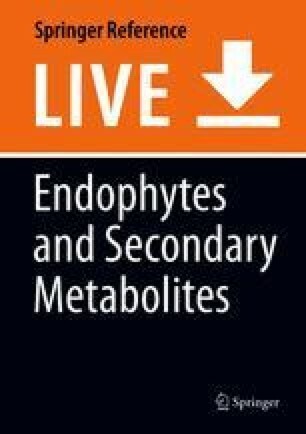 This book chapter reviews some of the endophytic fungi isolated from marine sources that produce metabolites with various biological activities against human pathogenic microorganisms. The potential for the exploitation in the pharmaceutical industry and concerns are also discussed.